It’s hard to remember a time before recruiting was primarily handled online. Newspaper job advertisements and faxed resumes have been replaced with online job boards, video interviews, and recruiting tools. The introduction of this technology has revolutionized the world of recruiting making the process quicker, easier, and more accessible than ever before. Along with new technology comes a shift in the job market. In today’s competition for talent, employers find themselves battling for the best candidates. Recruiting is less about weeding through piles of resumes and more about attracting the right type of candidates and giving them a reason to want to work for you. With a new way of communicating and a new set of tools, HR professionals may need to tweak their strategy in order to attract, find, and hire talent for their organization. Here are six simple tips that will ensure success in online recruitment. 1. Think like a marketer – Reviewing resumes and conducting phone screens are old hat. Writing snappy job descriptions, producing engaging career sites, and creating an employer brand are now part of a recruiter’s responsibilities. In this competitive candidate landscape, you need to entice qualified candidates. 2. Be accessible – Did you know that 9 in 10 job seekers search for jobs on their mobile device? According to a recent survey from iCIMS, only 46 percent of companies have a mobile-optimized application process. Be sure candidates can easily search for and apply for jobs on their mobile device in order to appeal to job seekers who are on the go. 3. 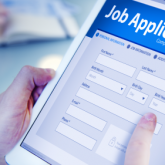 Make it easy to apply – Candidate experience has been a hot topic for recruiters for years, but still 46 percent rate their experience for applying for jobs as poor to very poor. Delight your applicants by making it simple and straight forward to apply. Only require the information you absolutely need up front, reserving other questions for later in the hiring process. Plus, 69 percent of candidates are more likely to buy from a company after a positive application process – an added bonus! 4. Be proactive, not reactive – Savvy recruiters are always nurturing so-called passive candidates. Knowing that 63 percent of full-time employees are looking for a new job, can we really call them passive? Organize your passive candidates using talent pools and nurture them with personalized messages. A candidate relationship management tool (CRM) helps automate these processes. 5. Check your tech – Simply having HR technology isn’t enough in today’s competitive landscape. If recruiting is a top priority within your organization, make sure the tools you are using are focused on talent acquisition and not just an add-on to a larger suite. You need the best applicant tracking system (ATS) supported by talent acquisition tools to truly streamline your processes. 6. Bring it all together – Chances are you are using a whole slew of software systems in your recruiting process beyond your ATS, including background screening, assessments, and reference checking. Create one workflow through a Platform-as-a-Service solution to integrate your software systems and centralize all of your recruiting data in one place.